Ever since I discovered the examen prayer a few years ago I’ve been fascinated with finding different ways to pray each day. I grew up in a church without a strong liturgical tradition, so these things were new to me. However, they are ancient to Christianity. One ancient, though lost, way to pray is through the use of a prayer wheel. 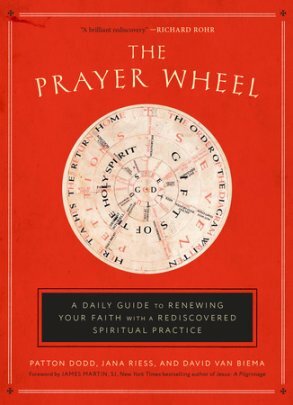 The practice goes back to the time of Augustine, though the seven-spoked wheel illustrated in the book dates to around the mid eleventh century. It was pasted into the inside front cover of a manuscript of the Four Gospels where it stayed for two-hundred years, before being shelved for eternity it would seem. That is until 2015 when it was discovered in a New York gallery. This ancient practice has now found new light and new life. The prayer wheel combines seven aspects of the Lord’s Prayer with seven gifts of the Spirit, Seven events from the life of Christ, and seven Beatitudes. As you pray from the outer wheel to the center, where “God” is printed prominently, you pass through each aspect until you reach the opposite side’s fulfillment. For instance, “Holy is your name” leads through the gift of wisdom and the Incarnation of Christ. This leads one to seek out being a peacemaker and thus being called a child of God. This would seem like a novel approach to prayer, however it’s application can be quite powerful. I’m excited to spend some time in prayer through these seven positions. The best part of the prayer wheel is that you can actually make it your own – adding more wheels, like the seven deadly sins or the seven days of creation. It will definitely be another prayer tool in my toolbox. Disclaimer: The publisher provided me with a copy of this book in exchange for a fair review.